Talking to a columnist in 2009, Terrel Hansen's assessment of his career was succinct. "I was always in the wrong place at the wrong time or behind somebody," Hansen told The Kitsap Sun of Bremerton, Wa.. "But when you are a $100,000 guy and there are $6 million guys ahead of you, those guys have to play. That is just a part of the game." Hansen was speaking of a professional playing career that spanned 13 minor league seasons and two major league days. That's two major league days. 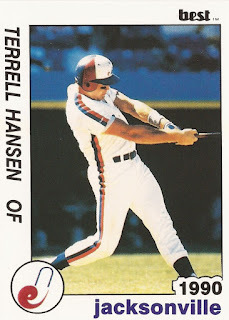 Hansen's career began with the Expos, taken in the 14th round of the 1987 draft out of the University of Washington. He started at short-season Jamestown, then made West Palm Beach in 1988 and Rockford in 1989. It was AA Jacksonville in 1990. Hansen never hit better than .269 in those four seasons. But he did become a home run hitter. He hit 16 for Rockford and 24 for Jacksonville. It was enough for the Expos to ship him to the Mets in a four-player deal, getting Alex Diaz and Darren Reed in return. With the Mets, Hansen found a home at AAA. He would play the next two seasons there, at Tidewater. Then it was back with the Expos at AAA Ottawa. His final three years in affiliated ball were spent largely at AA Jacksonville. In 1994, Hansen hit .317 and made the Southern League All-Star Team. In 1996, Jansen hit the most home runs he'd hit in a year, 26, 25 of those at Jacksonville. Two of them came in one June game. His four seasons at Jacksonville, for three different organizations, earned him a spot on the all-time Jacksonville Suns team from The Jacksonville News. His time in affiliated ball over with 1996, Hansen held on three more years with independent Chico. He hit 46 home runs over three seasons, earning a spot in the Chico Pro Baseball Hall of Fame in 2005. He's since moved into teaching baseball, as an instructor. Back to those two days in the majors. Those came in 1992, with the Mets. Called up in late April when infielder Kevin Baez went down. He was sent back down two days later, as Vince Coleman came off the DL. He never got an at-bat, or in a game. At one point, according to The Sun, he was going to pinch-hit, but was told to put the bat back down. The starter was going to stay in. To make the situation worse, just after Hansen was sent back down, the player who prompted it, Coleman, got hurt again. But Hansen couldn't be brought back up, not for 10 days due to a rule about recalling players, The Sun wrote. His replacement, according to The Sun, stayed up for a month. Hansen never got back.